The anti-globalist movement is continuing its spread worldwide, with thousands of citizens in Taiwan and Lebanon rising up against their governments’ push for globalism. Inspired by the revolution that started in France last month, the movement has spread across the globe, with demonstrators in Asia and the Middle East calling for an end to the New World Order’s push for globalism. “We demand respect for our rights. Where is the medicine? People are dying at the doors of hospitals. The government has been inactive for years; what do we need such a government for? Let them resign!” a protester told Sputnik. “Seven months ago we elected a parliament that hasn’t yet been able to form a coalition government. This means the parliament simply doesn’t perform its functions, it has failed,” the demonstrator said. In Taiwan, thousands of citizens donned yellow vests on Thursday to protest outside the Ministry of Finance, the architect of Taiwan’s tax system, after feeling inspired by the unrest in Europe. According to the LA Times, their campaign is the first major one in Asia inspired by the French revolution. Latimes.com reports: About 20,000 Taiwanese participated in demonstrations last week outside the presidential office, and about half that number protested in the capital of Taipei on Saturday, according to organizers and local media reports. The protests have all been peaceful. With their yellow vests worn under clear plastic raincoats, the Taiwanese protesters yelled slogans demanding that President Tsai Ing-wen’s government overhaul the income tax system. Some waved banners calling current policies illegal and blared airhorns outside the ministry offices, which were guarded by police. Many at Thursday’s demonstration complained of receiving tax bills in error. Appeals against taxes cost too much, some argued. Tax rates deter young people from starting companies, discourage foreign investors from doing business in Taiwan and hurt entry-level workers who already struggle with low wages, they said. 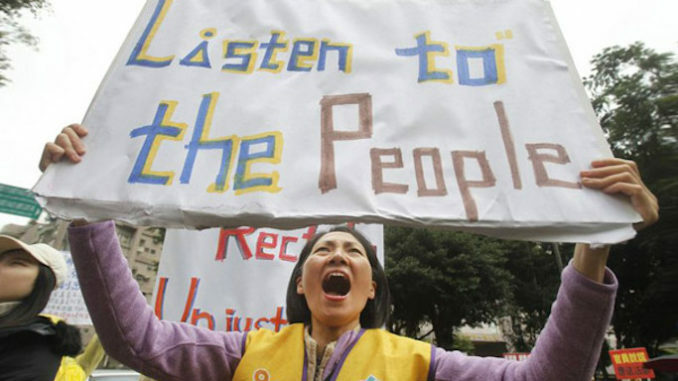 Wages are a particularly sore point for Taiwan. The minimum wage will reach $750 per month in January, and wages now average $1,364 per month, often too little for workers in Taipei to afford housing unless they live with their parents or friends. “They play dead and don’t come out and say what the problems are,” said protester Lily Chen, 48, pointing to the finance ministry high-rise. Her qigong group (similar to tai chi) has been fighting back taxes for 22 years. The finance ministry has heard a lot of the protest complaints before and rebutted some in statements on its website, a ministry official said Wednesday. “Their demands are actually old and spread a lot of erroneous information,” she said. She was not authorized to give her name. Taxes cannot make taxpayers “poor,” contrary to some protest voices, because Taiwanese are allowed to pay in installments, ministry section chief Tsai Meng-chu said. Taiwanese who earn less than $78,500 a year pay no more than 20% in taxes, according to data compiled by KPMG. The professional services firm ranks Taiwan’s taxes 33rd highest in the world out of 135 countries and regions. The United States ranks 39th. In late November and early December, tens of thousands of marchers in France clashed with police over taxes and wages. Some demonstrators lighted fires. Ten deaths have been blamed on the protests. French President Emmanuel Macron eventually scrapped a fuel tax hike and pledged to increase the minimum wage. The French movement has spread as well to Belgium and the Netherlands. Belgian protesters destroyed several police vehicles as they called for the prime minister to quit over taxes, wages and food prices.